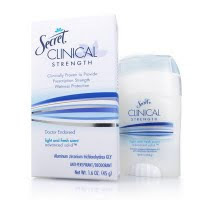 WELCOME TO MY MONEY MISSION ONLINE: FREE SECRET CLINICAL STRENGTH DEODORANT! Are you a member of vocalpoint? Log in and click on the latest "try and tells." You'll be able to request a FREE Secret Clinical Strength Deodorant from Vocalpoint. Not a member yet? Register here to try it for yourself - Vocalpoint members get a free sample. I love Vocalpoint....In the past, I have received coupons from them for a free box of Rice Krispies, the new Bounce Dryer Bar, and various assorted high value coupons for cereal like Kashi!